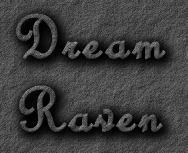 Welcome to the home of Dream Raven, a new author. Dream Raven is a pen name for me. I'm a stay at home mother of two. I write web-pages and design websites from home. I decided to take the plunge and try writing a few eBooks. The first book is called Homemade Rodent Staple Mix and the second book is called Do-It-Yourself small animal toys. I have 24 years of experience with rodents and other small animals. I decided to share some of my staple mix formulas and some toy ideas. Next, I'm trying my hand at a four book short novel series. Updates about my writing can be found on the Announcements page. Books can be found on the Book page, with links to purchase the books. I decided to use Weebly for my author site instead of creating a new site from scratch. This gives me more time to write and keeps my webdesign business separate. This will just be a very simple basic site for my writing.